Many Christian parents, although active in their churches, are crying for help because they cannot understand or cope with their wayward children. Counselor and author Guy Greenfield has discovered and dealt with many wounded parents who are searching for guidelines to come to terms with themselves and their children. The Wounded Parent provides both immediate and long-range help for parents whose children have rejected the spiritual values of their parents by choosing a value system and behavior pattern outside the evangelical tradition. This book also helps parents to rebuild the channels of communication with their children and to construct new relationships with them. Guy Greenfield is Director of Panhandle Pastoral Counseling Ministry in Amarillo, Texas. Former Pastor and Professor, Dr. Greenfield is the father of a daughter and two sons. A graduate of Oklahoma Baptist University (B.A. ), Texas Tech University (M.A. ), and Southwestern Baptist Theological Seminary (M.Div., Ph.D), Dr. Greenfield has authored five other books, including The Wounded Minister and Re-Igniting Love and Passion. He is also a member of the American Association of Pastoral Counselors and the American Association of christian Counselors. Guy Greenfield’s broad range of experience helping families has been distilled by his love for moms, dads and children. 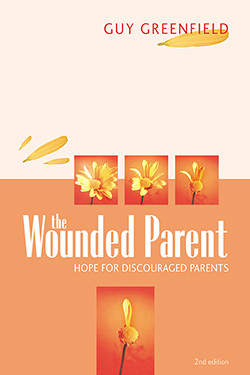 In The Wounded Parent, he offers patient, gentle, understanding help that is at once incisive and practical. Don’t wait until you need this book (or friends or loved ones need it) to buy it. It should be read from pregnancy until the kids are long gone from home.